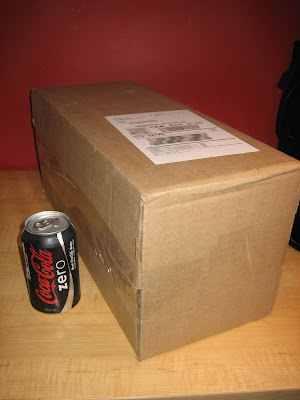 I arrived home today to find a package from Lexmark waiting for me. A four-pack of photoconductor! Lexmark's solution to the problem. 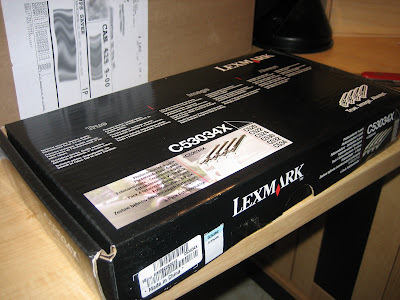 Sealed as "genuine Lexmark". Will it get rid of the yellow dots? STAY TUNED TO FIND OUT! (updating throughout the evening). Photoconductor units are swapped. Initial prints reveal presense of yellow dots. Scans to come. Before swapping photoconductor units I printed one last set of Menu Settings Pages and Print Quality Tests for reference. I carefully noted serial numbers of all of the new (and old) photoconductor units. I was careful to make sure that I could match which "slots" the old units came from and where the new ones were placed. I have photos of each "pair", and can say with certainty which new units replaced which old units if necessary. First batch of menu settings pages and print tests. By initial observation I can still see a yellow dot pattern, and it appears to be identical to the old pattern. STAY TUNED FOR HIGH-RES (CROPPED) SCANS OF THE NEW PRINTOUTS. The nail is in the coffin: photoconductor units are not responsible for the yellow dots on Lexmark C530 printers. Here is how I make the dots more visible to the human eye in Photoshop, step by step. 1. Scan image at 1200dpi. Open with Photoshop. 2. Image -> Adjustments -> Brightness/Contrast: Set contrast to 100. 3. Image -> Adjustments -> Desaturate. This turns everything black and white. 4. To test to see if the photoconducter units changed the dot pattern, I overlaid the dot pattern I had previously scanned and "developed" with Photoshop. The purple boxes are the previous pattern with a magenta background, red stroke, 50% transparancy, laid over the new scan. The dot pattern is clearly and obviously identical. 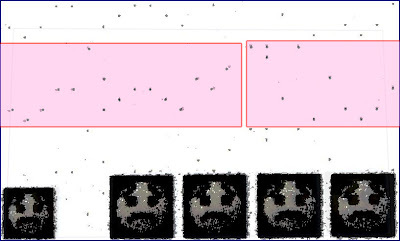 Note that this process only filters colors that are already present in the image; it does not place any new information into the scanned image. Replacing the photoconductor units does not change the tracking dot pattern. Replacing your photoconductor units is Lexmark's first line of defense when you send them evidence that yellow dots appear on all of your printouts. A full set of photoconductor units retail for between $104 and $149. Also, I just realized that my support rep did not acknowledge the fact that I had mailed them samples from two other printers. That is a point I will have to bring up when I deliver the news that this $150 "fix" didn't work. Thanks for your assistance so far in trying to find a solution to this yellow dot problem. I received a C53034X unit in the mail today - a new set of four photoconductor units. To make a long story short, the replacement photoconductor units did *not* fix the problem. I still see the yellow dots on printouts, and the pattern is exactly the same as before. I documented the whole replacement process. I have serial numbers of old and new photoconductor units, photographs of the whole process, new Print Quality and Menu Settings pages, but I don't want to swamp you with information you don't need. I don't know if I made it clear in my previous correspondence, but in the support package I mailed, I included printouts from two other Lexmark color lasers I have access to - not just my home unit. The units both printed a yellow dot pattern as well. To me, this is evidence that yellow dots are common to Lexmark color lasers, and not a problem isolated to my home unit. Please advise on what the next course of action is to try and remove these yellow dots. I am prepared to send any printouts and documentation you require, or send back the new (or old) photoconductor units if need be. your blog very helpful for me.keept up. Here we leave a comment for HP printer support through remote assistance. Get remote asistance for all type HP printers.Toll free number 1-877-937-1377. If you randomly add very similarly placed dots and patterns to every document you print you effectively disable this process. Or preprint your white paper covered in yellow dots then run your documents as usual. should prevent decoding.